For the Second Examination of the Chunin Examinations, the teams of three will be playing a game of “Capture the Flag”. While Sarada and Mitsuki infiltrate enemy territory to grab their flag, Boruto has taken on the role of defending their own flag by himself. 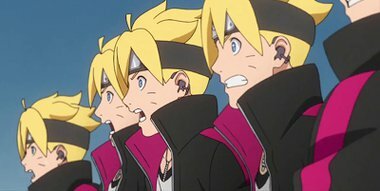 However Boruto is caught in a pinch as he get attacked by the three Senka brothers of the Village Hidden in the Mist.